After two seasons the Chicago Cubs are moving on from Kane County, and will begin a player development contract with the South Bend Silver Hawks next season (Low A affiliate). For me this is disappointing only because it was very easy to get to Kane County to see the Cubs prospects play, South Bend is a little further. On the bright side, the Silver Hawks are still in the Midwest League, so they will travel to Kane County regularly. As pointed out on Twitter, Kane County is in a different division, and South Bend will not travel there in 2015…. Never mind that “bright side” comment. South Bend would kill to get the Cubs, not saying they did…. (nervous laugh) but they were hard after the Cubs for a very long time, and it now is coming to fruition. The main reason for moves like this are to enhance the player development within the organization, hence “player development contract.” For the two years with Kane County, the Cubs wanted major improvements to the facilities, and while the Cougars announced that they were making upgrades this offseason, it seems as though it wasn’t enough. I’m sad to say so long to the good people at Kane County, but excited for South Bend Cubs baseball, hope the price of gas goes down next summer…yeeeeeaaah. The task facing the Daytona Cubs offense was a tall one coming into game one, Matt Boyd had been lights out for Dunedin in 90 innings of work this year. Not tonight. The D-Cubs torched Boyd for seven runs over the first 3.1 innings en route to an 11-1 laugher. 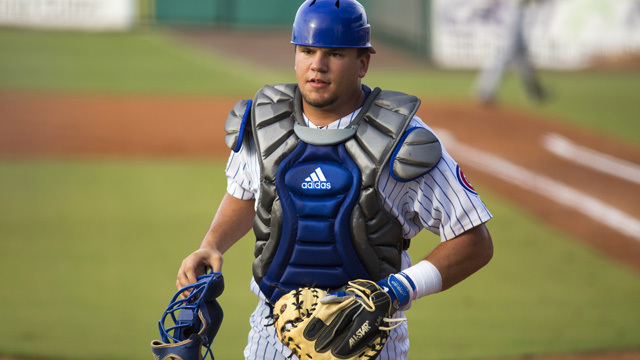 Kyle Schwarber was 1-for-5, but it was a big one, a two-0ut grand slam in the fourth inning. He finished with four RBI’s, and one run scored. Dan Vogelbach had a huge game, he went 2-for-5 with a double, a home run, two RBI’s, and two runs scored. Billy McKinney hasn’t slowed down all year, he went 2-for-4 with a double, and two runs scored in the win. Willson Contreras was solid behind the plate, and at the plate, he went 3-for-4 with an RBI, and three runs scored. Bijan Rademacher was also productive from the bottom of the order, he went 3-for-3 with three RBI’s. Rob Zastrynzy got the start, and was brilliant in picking up the victory. Zastrynzy worked six innings, giving up one run on five hits, while walking one, and striking out four. The D-Cubs pen worked three scoreless innings, but struggled with their command. Starling Peralta worked an inning while walking two, and striking out one. Gerardo Concepcion worked an inning while walking three (See? ), and Jose Rosario mopped things up, working an inning while giving up two hits. Game two is tomorrow night, the D-Cubs have a chance to make quick work of the best of three series. 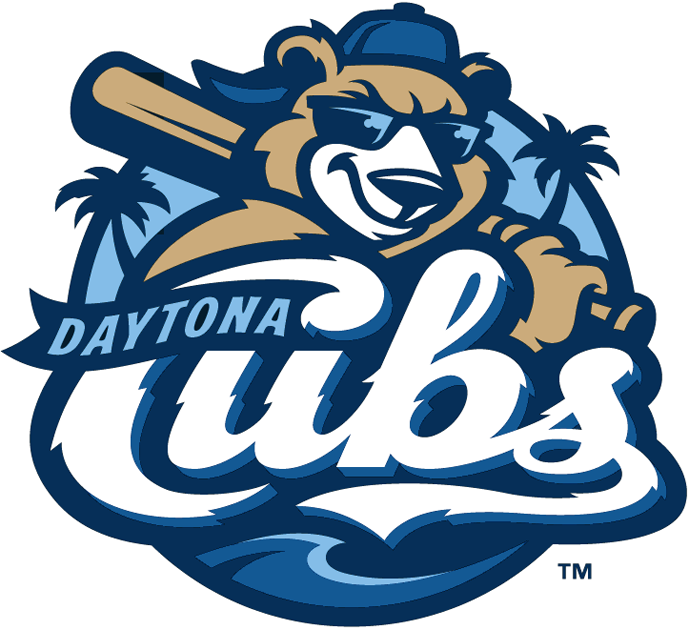 If I would have told you that the Daytona Cubs would be participating in the FSL Playoffs this year you would have called me crazy, and probably kicked me a couple times. But here we are, after a horrendous start to the season, the D-Cubs torched the FSL North in the second half of the season, going 41-27 thanks to some key additions to their lineup. The two additions I’m thinking of are Kyle Schwarber (2014 1st round pick), and Billy McKinney who was acquired from Oakland in the Samardzija/Hammel deal in July. Schwarber played in 44 games for Daytona this year, he hit .302 with ten homers, and twenty-eight RBI’s while OPS’ing at a .952 clip. Schwarber also knows how to get on base, he walked twenty-six times against only thirty-eight strikeouts. McKinney had a similar season with Daytona, minus the power. McKinney played in 51 games with Daytona, he hit .301 with twelve doubles, four triples, one homer, and thirty-six RBI’s. Much like Schwarber, McKinney gets on base with the best of them, he walked twenty-five times against forty-two strikeouts, eerily similar to Schwarber. Game one is tomorrow night in Daytona, and the Cubs need to take game one before the best of three series shifts to Dunedin. Daytona sends Rob Zastrynzy to the mound in game one, Z was 4-6 with a 4.66 ERA with Daytona this year. A stiff test awaits the D-Cubs lineup as Dunedin will go to Matt Boyd who has been lights out this year, he went 5-3 with a 1.39 ERA this season. Check back for game updates, recaps, etc. Please don’t rain.